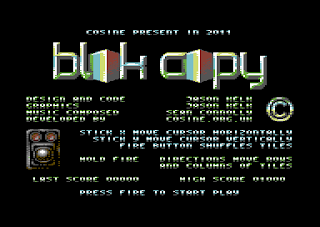 Cosine's T.M.R has set the ball rolling in our C64 16KB Cartridge game-dev competition by submitting the first completed game, a C64 port of his PET and C64 DTV block-shuffling puzzler "Blok Copy". Originally started as an Atari 2600 game (which remains unreleased to date), Jason emailed the game over earlier this week, advising that he wanted to get it out of the way so he could focus on the (mystery) release he has planned for the Replay Expo in November. A download link will be provided after the game is released by Cosine in D64 format. Blok Copy will be available to buy in cartridge format later this year, but in the meantime check out the video below.